Aery gives you more harass while Comet gives you more power in teamfights. Aim to build these two core items as early as possible. We can’t say that ’s champion concept completely changed through the rework, but they’re also far from being the same. To begin, Swain’s playstyle of absorbing damage and enemy aggression remains the same. However, in the past, Swain controlled the battlefield by placing ‘Q’ and ‘W’ throughout it. The new Swain, on the other hand, deals consistent damage through ‘Q’ and prevents the enemy DPS champions from dealing easy damage by threatening them with ‘E’. He is also a great champion for engaging, as Swain can pull them from afar. In addition, Swain can use his ‘W’ to limit the enemy team’s movement during teamfights. Lastly, the ultimate’s damage at the end of its duration can be used as a warning, you can keep your opponents at bay by threatening them with a large burst of damage. 0. Swain’s passive works with your teammates’ CC. So don’t limit your passive only to your . Practice your micro so that you become used to activating it as soon as you see your teammates landing a CC. 1. Let’s secure the blue buff from lane with . Your jungler may not be aware of its huge range, so let him know beforehand. 3. If you want to root your enemy often with , aim to hit the enemy at maximum range. 4. It’s easier to land when the enemy is going for a CS and/or after you’ve used ‘W’ to deter him from his initial path. 5. In order to activate ultimate , you need at least 1 stack. 6. If you activate your ultimate at 1 stack, the final damage of the skill can be altered by collecting more stacks during the duration of the ultimate. Don’t just hold on to your ultimate, thinking that you should gather more stacks before activating it. At those times, just activate the ultimate and calmly gather stacks. 7. Swain’s ultimate has a bit of a delay in its cast, so pressing ‘R’ won’t immediately activate it. ex) If you tap ‘R’ and Zhonya’s at the same time, you’ll cast Zhonya’s without your ultimate going off. 8. There is also a bit of a delay when you tap ‘R’ for the 2nd time. Both have clear pros and cons. It’s hard for Swain to do anything against champions with long range; primarily . If you can consistently land your , the outcome may end up being different; but if both players are at the same level of skill, and they harass from afar, there is almost nothing that Swain can do. Swain’s map presence with is insane. You may argue, “how big of an effect can a single skill bring?” But in a 2 vs. 2 fight, a single auto-attack and/or a single second of cooldown on a skill can prove very important. In that kind of a situation, Swain’s ‘W’ can be very helpful for the team by being disruptive for the enemy. It’s easier for Swain to roam when he’s at the center of the map(midlane) instead of being at the top. Also, Swain is much more powerful in teamfights than in 1 vs. 1 scenarios. It’s hard for top Swain to join teamfights, and his will only reach the midlane. It’s rare to see a champion with long range in the toplane. Even if that’s the case, however, Swain can consistently harass the enemy with his kit. Of course, there are exceptions, but Swain will relatively have an easy time against most toplane champions. Swain’s harass will hit hard against most champs, especially if you can manage to hit all 5 streams -- you might surprise an enemy with your burst and have them running away from you. Runes are selected upon your preference, but I’ll show you a couple that is widely used. The Future’s Market rune allows Swain to get his important core items, faster. Through patch 8.5, Time Warp Tonic was added into the game. It could be a very effective rune for Swain, so it’ll be added to this guide. Time Warp Tonic’s +5% bonus movement speed when under the effect of potions/elixirs is really good. 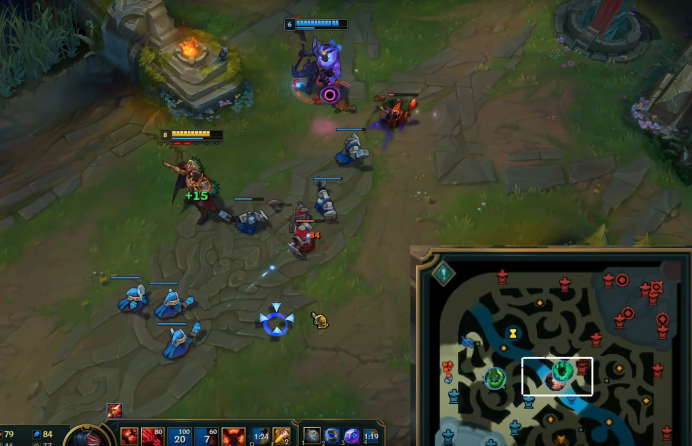 Swain has a very slow movement speed; sitting at 390 with upgraded boots. With the effect of Time Warp Tonic, however, Swain will have an MS of 409. With this boost, Swain can outspeed most other champions. This rune synergizes very well with Swain’s ultimate. In the midlane, it’s extremely difficult for Swain to land his consistently. That’s because most midlane champions come with ranged harass. If the player is at a decent level, he’ll know to hide behind minions and harass. In that kind of situations, you can land an auto-attack, send Aery as a result, and look for an opening with your . Arcane Comet : It can be triggered multiple times in a teamfight, adding a significant amount of AoE damage. With Swain’s characteristics, he can trigger Comet multiple times in a teamfight. But you must keep in mind that if you begin your skill combo with , activating your passive after can pull your target away from the comet’s range. Unsealed Spellbook , Glacial Augment , Phase Rush , and Electrocute . You guys may already know, but CDR was nerfed from 25% to 15%... that’s almost half of the original amount. Since Swain lacks dashes or really, any sort of escape mechanism, CDR to his Summoner’s spell is very valuable. However, the nerf to the rune is VERY significant. The rune is still useful, as it allows you to swap your spells freely, giving you the opportunity to take advantage of situations (such as switching to teleport while in base to surprise your opponents). However, you need to be at a certain level of skill to have the proper game-sense to utilize this rune in that manner. If you aren’t confident in your abilities, I advise you to take runes that’ll help you out during the laning phase. There are a lot of midlane champions that primarily use . But it’s important to note that most of those champions have an easy and quick way to land 3 hits from different damage sources. As for Swain, it’s true that he can trigger Electrocute with ease, but it still doesn’t deliver enough damage to compensate taking this rune. Swain specializes in dealing consistent damage/harass with ‘Q’, so he’s far away from bursting/assassinating targets with Electrocute. In my personal opinion, is a rune that needs a buff to be viable. It’s way weaker to the other keystones. Honestly speaking, I think even Fleet Footwork could be more useful than Phase Rush. I have also listed The Ultimate Hat , and it’s a must-have rune for Swain. Unlike before, Swain’s ultimate costs no resources, but its cooldown has been increased by a significant amount. Swain’s combat effectiveness is hugely affected by whether his ultimate is available or not. So it’s highly recommended that you take The Ultimate Hat as one of your bottom runes. You can also take Precision as your secondary, taking , commonly known as God-umph along with or . Triumph synergizes very well with Swain’s passive, allowing you to heal a very large amount of health upon killing the enemy team. This will allow you to sustain yourself on the battlefield longer. It’s also very helpful in 2 vs. 2 situations, allowing you to focus a single target down and heal from it. As a Swain, there are many situations where you’ll find yourself low in health during teamfights. Take Coup de Grace if you’re fluent in managing enemy aggression. If not, take Last Stand. Whether you’re a Swain with leg injuries or not, Flash is a must. Swain’s teamfighting prowess is incredible, both before and after the rework. This skill will allow Swain to join his team faster. If you’re taking Swain top, this spell is a must-take. Also, if you’re expecting a lot of harass, and you can easily be denied in lane, take this spell to farm as safely as possible. Swain no longer has a low DPS. With consistent harass and the ability to combo abilities with ‘E’, you can force your enemy to see black and white. Ignite can be a big help for those kinds of situations. You can take this spell depending on the situation. (Against burst damage champions like Syndra and Veigar, applying Exhaust on them before their big burst can allow you to absorb more damage. Also, against assassins that can kill you before you can even utilize your ultimate, such as Zed, Talon, and Yasuo, take this spell. Take this spell depending on the situation. ﻿Do I level Q or E at level 1? I’ve taken at level 1 over . Against a ranged opponent, there is almost nothing that you can do with ‘Q’ alone. With the superior range of ‘E’, you can limit your opponent. The biggest reason for taking ‘E’, however, is that you can right-click the target to both heal and DPS, gaining a stack on top of that as well. After landing at level 1, you can proc your passive to both DPS and heal -- in addition to a couple of auto-attacks. You can take a very one-sided trade in your favor. In the toplane, if your opponent is melee and/or you expect an easier matchup, it’s better to level ‘Q’ and harass your enemy with it. If you opponent becomes frustrated and all-ins you, simply kite him while landing as many auto-attacks and Q’s as possible. If he closes in towards your turret, land your ‘E’ and pull him towards your tower’s range. 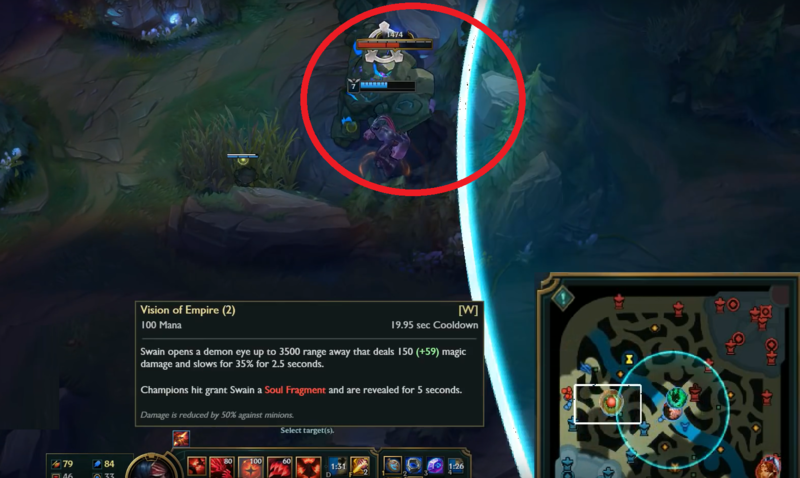 If you use the “E-W-Passive”, the enemy can be pushed back THEN pulled, so he may not take any tower damage. In addition, at level 3, you’ll have to decide whether to invest another point into or . For me, I take ‘W’ at level 3 if I foresee a potential kill with the “ ” combo. If that’s not the case, I level ‘Q’. Simply put, after landing your you’ll want to cast in advance on the direction of the enemy being pulled. Before the duration of the root ends, you’ll want to pull your target into the range. Afterward, landing an auto-attack followed by a will be the best-case scenario. In the case of this combo, the enemy won’t be able to escape due to the root. They’ll take all the damage from your skills at once -- highly likely to surprise your opponent with a big burst. Following that combo after an Ignite will be even deadlier, killing the enemy without even giving them a chance to react. Passive(Ravenous/Flock) - When right-clicking an enemy who is put into an immobile state(airborne, root, knockback, etc…), the target will be pulled towards Swain. You’ll also harvest a soul fragment, dealing magic damage, healing yourself, and obtaining a stack. It’s not always in your interest to pull your target who’s been rooted. So you must make the correct judgment depending on the situation. Pulling in a champion like Jax, who is very strong at melee range, will allow Swain to become an easy target. Also, you can hold onto your passive and use it when your teammate lands a CC on the enemy DPS. This will put the enemy DPS champion(s) in a very tough spot, often putting them in a situation where they’ll die regardless of having Flash or other Summoner spells. Q(Death’s Hand) - This skill will shoot 5 streams of demonic waves at a target location. This skill’s damage upscales by a LARGE amount for every point invested. Along with the boost to skill damage and bonus damage for hitting the same target with multiple streams, the cooldown of the skill receives a significant amount of reduction per level. THIS SKILL MUST BE MASTERED FIRST. Similar to Kalista’s ‘Q’, upon killing an enemy unit, the individual streams will penetrate the target and continue traveling. If hit by more than 1 stream, each extra stream will cause 15~35% extra damage on the target. If you manage to land all 5 streams, basically, you’ll do about double the damage of landing a single stream. Also, it’s completely possible to land all 5 streams from a distance of ⅓ of the skill’s total range (there’s no need to stand right next to your target). There are some people who have difficulties wave-clearing with Swain, but in truth, Swain has a great wave-clear. As mentioned above, the individual streams can penetrate its target when landing the final blow, use this to your advantage. It’s possible to land all 5 streams from a ⅓ distance of your total ‘Q’ range. By taking advantage of this, gather and stick close to minions with low health and with the damage boost of ‘Q’, you can easily clear the lane. Targets hit by this skill will be ripped of a soul fragment. Along with the stack, you’ll also absorb some health. This is immensely helpful. However, there is a 2-second delay between pressing the ‘W’ key and the skill actually landing on your target location. Due to that delay, it’s difficult to land the skill. In addition, the skill’s damage is halved on any target not a champion; so the skill isn’t useful for wave-clearing or jungling. However, there is more to this skill than just cons. While in the midst of combat, try your best to land your ‘W’ on as many enemy champions as you can. Not only will it give you a lot of stacks through your passive but it will also instantly recover your health to a certain extent. A big bonus is that you can secure your blue buff while staying in lane with just your ‘W’. An example of the skill’s effect on the map: a 2vs2 fight just broke out in the toplane. Start making your way up to top and use ‘W’. In a 2vs2 fight, the enemy trying to dodge the skill will end up losing DPS, if he is to ignore it, it’ll apply a 2.5 second slow. Whatever he decides to do, it’ll put him in an uncomfortable spot. When your lane opponent leaves the lane for his blue buff, you can cast ‘W’ on their blue and check. You can also do the same for the enemy red buff. Checking where the enemy jungler is, immensely helps yours. This can also prevent you or your teammates from getting ganked. It’s also great for checking Baron/Dragon. You can also use the skill to cut off the enemy’s escape path. Instead of dropping the skill right on top of them, try to put it in their path. The target in escape will either have to deal with a 2.5 second slow or run in another direction. Either way, you increase the likelihood of killing him or her. Simply put, the skill is hard to land unless you’re following it up with . But if you think about it in the other way, you can place the behind the enemy, limit his movement, and have an easier time landing the “ - - ” combo. Trying to dodge the damage from a level 1 will end up being fatal - if he takes the hit, even better, as he’ll be slowed; becoming an even easier target for the rest of your skills. You can also use it when your jungler is ganking your lane. Use to make the enemy take the long escape route, then look for an opportunity with your . E(Nevermove) - This skill has a similar skill mechanism to Ahri’s . When the projectile hits someone on its return to you, however, the projectile disappears and roots its target and every enemy unit in a small area. (You can pull one target towards you at this time with your passive.) Landing multiple roots during an invasion or teamfight can really put the fight in your favor. As explained above, you can land more frequently if you use to limit your target’s movement and/or when he’s going for a CS. The trick to have an easier time landing the root on is to try and hit your target with the very tip of the skill’s range. This is a skill that lets you pull marksmen who turtle behind their tanks. However, missing this skill brings a big risk. If you are not in a situation to easily land your ‘E’, just save it and use it for your own safety (ex: when an enemy bruiser comes for you). In that case, however, it could be dangerous to pull him towards you with your passive, so use it carefully. R(Demonic Ascension) - This is the coolest ultimate in the game. The mechanism of this skill is similar to that of the old Swain’s. An AoE damage circle surrounds Swain upon activation and heals him. He also gains health(maximum health and not a heal). Once the ultimate ends, your maximum health boost bonus will end. The health boost mechanism is the same with Nasus and Renekton. During the duration of your ultimate, you can send out a wave of damage by pressing a second time when you have reached the amount of lifesteal needed OR waiting out the entire 12-second duration. If you can, try and maintain your ultimate for as long as possible. The fact alone - that the ultimate is on - applies pressure on the enemy team. However, if you see an opening to severely impact the enemy’s team formation, and/or the chance to kill the enemy’s main DPS champion, go ahead and activate the 2nd part of it. Using the ultimate following Flash can also be very effective. In addition, use your and to slow down/pull the enemy towards you. The ultimate is awesome, and it’s great to turn fights around in your favor. Also, note that the ultimate isn’t interruptible by CC. This doesn’t mean that you’ll be immune to CC; it means that your ultimate will continue to channel even when CC’d, unlike Anivia’s ultimate. - Against enemy units who AREN’T champions, you only absorb about 20% of health that you would absorb from champions. So it’s highly recommended that you don’t use it during lane for the purpose of sustain. - The damage of the 2nd part of your ultimate relies on stacks that you gained all the way before the explosion. Remember that you can still acquire stacks even while the ultimate is channeling. - The 2nd part of your ultimate has a bit of delay before actually activating. So you have to think a bit ahead of time. 2018.03.15: Purchasing Haunting Guise before Zhonya’s. Going for the Haunting Guise(HG) before Zhonya’s is very efficient. Not only does HG cover for the loss of DPS from having to build Zhonya’s, but it allows Swain to absorb a decent amount of damage in early teamfights. HG’s Madness passive is also very, very good. However, always keep in mind that your first priority is Zhonya’s. Your combat effectiveness in teamfights largely depends on that item. ex) If the enemy midlaner has a skill that you need to ignore to survive, such as Veigar and Syndra, build Zhonya’s first. In addition, build Zhonya’s first against champions such as Azir and Cassiopeia, where you have no choice but to tank them in order to farm. As a champion with limited range, he has to both sub-tank and attracts enemy aggression. So in order for him to do that, he needs to build relatively tanky to do his job effectively. Depending on the situation, you have to build one of the following boots: Sorcerer’s, Mercury, and Ninja Tabi. Ionian boots are also good for getting early CDR to help you in lane -- but be wary that you will most likely run low on mana before getting your RoA. Cassiopeia is an official counter to Swain. This item works fantastically against “CONSISTENT DPS” champions, such as Cassiopeia, Azir, Morgana, Kayle, and Karthus. If the champions mentioned above are well-fed, Adaptive Helm is a must-build. Liandry’s passive and Rylai’s passive work hand-in-hand. Although landing E and W doubles Lindary’s passive, applying slow with your ultimate alone also does the same. Once you get these two items, you’ll notice a significant increase to your ultimate’s DoT damage. Riot made Liandry’s into a tank’s item through this patch. For Swain, a champion that sticks and stays alive throughout the most of a teamfight (allowing Swain to consistently apply Liandry’s), Liandry’s has become an even better item for Swain. Through patch 8.4, Archangel’s Staff received Max Mana and CDR. However, I believe the extra mana is excessive. As long as you keep your eyes on your mana bar during the early stages of the laning phase, you can pretty much play without needing more. However, the item is still a solid option for its shield(works well with ult) and CDR. (2018/03/01) Update: I tried building Tear - RoA - Zhonya’s - Archangel’s. My conclusion is that: you end up with too much mana. However, you do get an increase of about 80AP through the staff’s passive. Also, using its active(shield) gives you another chance to survive, so it’s very useful. Although its cheaper than RoA, Protobelt is similar to the item as it provides Swain with all necessary stats. However, the best part of this item is its active. It’s way too useful for when you need to find an opening to initiate a teamfight. This item allows Swain to close the distance at a fast pace. In skirmishes, you can land your ‘E’ and use the item to keep your enemy at a distance. It’s also great for when it’s you who is doing the chasing. However, finding the right time to buy this item is hard. Building this item as your 1st core item leaves you with too little mana during the laning phase. Building this item 2nd over Zhonya’s takes away Swain’s aggressive playstyle during teamfights. Enemies can easily walk out of your ultimate’s range, but with this item, you can more reliably land the 2nd part of your ultimate by closing the gap with the item’s active. In conclusion, this item synergizes very well with Swain’s kit. This gives Swain, an immobile champion with no dashes, a set of wings. If you have a good understanding of the champion, this item is good enough to build it after you complete your two core items(RoA, Zhonya’s). While being very affordable, it’s a very useful item for Swain -- for both the early and late game. This item has all the stats that Swain needs. Also, it covers for Swain’s high mana cost in the early game. The HP from RoA also helps Swain in tanking. After his rework, Swain is more affected by AP than before. His ratios have become significantly higher. If you build AP, you’ll easily notice the power spike. So when building tank items, it really makes me consider my options. Build this item if your enemy top, mid, and jungle are all AP, and you can’t withstand their attacks; or if you have no tanks in your team, so you have to be the one to tank. I think building this item first can also be a possibility if you were deprived of CS during the laning phase and your RoA was heavily delayed WHILE the enemy team’s AP DPS champions are becoming a problem. It’s even better if you start with a stopwatch. The item is perfect for when you draw too much attention in teamfights. As a Swain, you often get into that kind of situation, so this is an item that you’d want to build as fast as possible. However, RoA’s stat distribution on Swain is too efficient to build this first. But if you feel that you need Zhonya’s first, go ahead and build this item. The CDR from Zhonya’s is a great bonus as well. As the last item, Rabadon’s is a very efficient item. It multiplicates your AP, giving you a huge boost to your damage. Its price has increased by 100g, and its bonus AP has decreased from 100 to 80. Along with those changes, its bonus maximum mana has decreased by 400, and it was given 15 M.Pen. In my opinion, it’s definitely a nerf to the item. However, since fewer champions will be building this item as their core, it’s an indirect buff to Swain! You can gain a lot of M.Pen for a cheap price by purchasing this item. However, this item envies Liandry’s for its bonus to health. But remember, this item is still very good for its price! Build this when there are a lot of AP damage dealers on your enemy team and you feel like you’ll be burst down too quickly. Example of champions to build this against are Veigar and Syndra. It packs a good amount of AP, MR, and CDR. Lucian : For Swain whose skills are all non-targets, Lucian is a pain. Not only is it hard to land ‘E’ on this guy, but the risk that follows from missing you ‘E’ is huge. His auto-attacks will also bring you a world of pain. Make sure to hold on to your ‘E’ and only use it when Lucian has his dash on cooldown. This champion is just too hard to lane against. I advise you to play your lane safely and wait until the late game. If he, however, gets hit by your ‘E’ enough time, it’s enough to beat him in lane. Azir : You will probably run into him often. With his long range, he’ll torture you in lane. Due to his usage of W-Q, looking for an opening to land your ‘E’ becomes extremely difficult. It’s easy for you to be denied in lane. If both players are evenly skilled, I’d advise the Swain to pull the lane and farm safely as possible. Going for Adaptive Helm is great against this champion. Katarina : Katarina can’t endure a consistent barrage of Q+Auto from Swain. As long as you watch out for Katarina’s Ignite combo at level 2 and 3, you can deny her throughout the entire laning phase. While keeping your eye on the minimap for the enemy jungler, harass her with your auto and Q. (If there are a lot of enemy minions, just harass with Q, it won’t pull the minions towards you.) After a certain point, you can use E-W-Passive-Q for the kill, or for sending her home. Kassadin : Similar to the Katarina matchup, try to consistently land auto+Q harass. If you see an opening, use your ‘E’ to chain a combo. Keep an eye out on your mana bar, and keep harassing him. After 6, even if Kassadin comes in first with his ultimate, you can send him running with your close ranged Q. When you get a chance, just turn your ultimate on and kill him. Most Melee Champions: Swain is good against most melee champions. He can be considered a counter to melee-mages like Fizz and Ekko . - You can win against almost any champion if you are consistent with your . - On the contrary, if you easily waste your , you can easily be denied. - Gank, mana, and -- always pay attention to these 3 while laning. - More easily said than done, whenever you spot your team fighting on the minimap, support them with your . It’s much easier to land on distracted opponents than on your lane opponent. - Swain can affect the entire map with his ‘W’, especially if you’re the midlaner. - Consistently keep track of the enemy jungler with your ‘W’. - Swain’s passive can be trigger by all of your allies’ CC. In fact, you can even activate it through Trundle’s pillar when it slightly lifts the enemy champion! - At level 1, when hit by Swain’s ‘E’, auto, and passive, most midlane champions will have no choice but to give the lane advantage over to Swain. If you win the trade at level 1, consistently shuffle around the enemy minions and look for an opening to harass with ‘Q’. With the enemy midlaner backing away from his minions, you’ll have an easier time landing your ‘E’. - Fights will start breaking out all throughout the map. You and your team will start focusing on taking objectives at this point. Swain isn’t a great split pusher or an assassin, he is a great teamfighter. 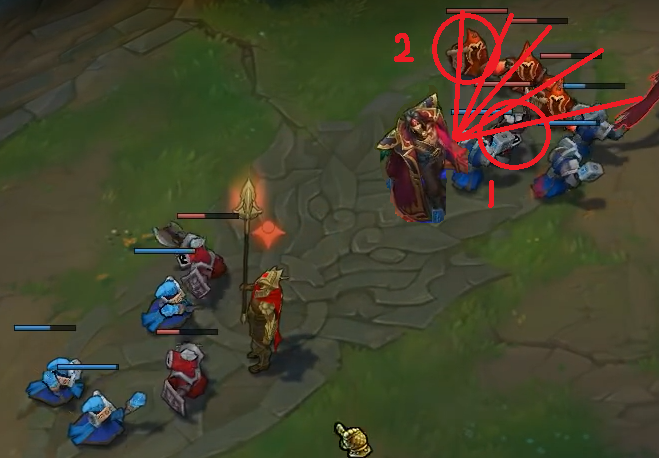 Clear your lane as soon as possible and keep check of the enemy red/blue buffs and objectives. Swain has various role in teamfights. With ‘E’, Swain can cripple enemy champions with his passive. Also, he can use his ‘E’ to initiate a fight. Before getting too focused by the enemy team, back off and start looking for an opening with your ‘E’, again. You can also ult+Zhonya’s in the middle of the enemy team to scramble their formation and heal, giving you more health to further be an annoyance to the enemy team. And this is easily looked over, but Swain’s ‘W’ is very important in teamfights. During the fight, you’ll have to concentrate on hitting as many enemy champions as possible with it. With ‘W’, you can restore a significant amount of health, while gaining bonus stacks. One good usage is: When an enemy champion jumps on top of you for the kill, immediately cast ‘W’ on yourself and pop Zhonya’s. The enemy will have no choice but to either back off, or get hit by the ‘W”. - Swain’s wave clear is out of this world. You can clear a wave in 2 seconds with Q-E-Q. Quickly push your lane to join your team. Or, consistently harass the enemy jungler and track him down with “W’. The most important thing for Swain is to: DO YOUR OWN THING, BUT NEVER BE LATE FOR A TEAMFIGHT. You can almost always take a fight in your favor if you start a teamfight with your ‘E’ by pulling either the enemy DPS champion, or depending on the situation, an enemy tank to quickly kill him before the rest of the enemy team can react.